We are an USDA Licensed facility with a Class C Exhibitor license with one goal in mind: to educate the public on Primate Care. While we don’t claim to be the experts in the field, we do have over 10 years of experience with primates and are in close contact with people that have raised primates for over 30 years. Our PrimateCare.com site is the oldest site related to Primate Care available on the internet! While it can be challenging to keep primates as pets, they can at the same time also be amazing companions. On our site we try to highly the good, the bad, and what you need to look out for. You’ll also find many tips regarding primate enrichment since that is the number one challenge with pet monkeys. Before obtaining a primate as a pet, it is important to do a lot of research regarding their care as it should not be taken lightly. It is at that point you’ll also need to figure out what you’re looking for in a primate. There are many different species and they’re frankly all pretty unique. Besides the initial expense to purchase your pet monkey, you’ll quickly notice that this is just the beginning. Just to give you an idea, we spent on average of $80/week on fresh vegetables/food for 1 capuchin. Vet care can also be quite challenge since it isn’t always easy to find a vet willing and experienced in treating your monkey. We recommend that you at least visit a primate owner once before making the jump. If you live near Western Illinois, you’re more than welcome to come and visit our home where we’ll talk about laws, care, diet, enclosures, toys, enrichment, and more. 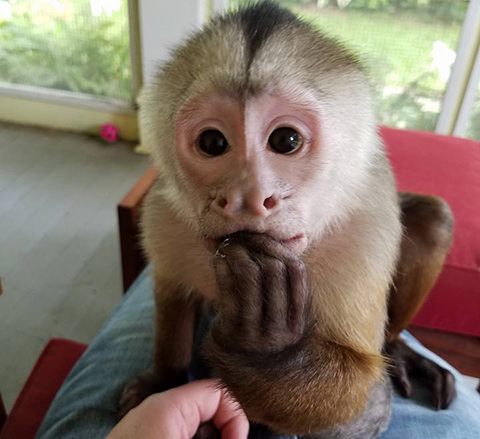 For those living in Illinois, keeping a primate as a pet is no longer permitted by law unless you were grandfathered in years ago. Our average sessions typically last about 1-2 hours. We’ll do a meet and greet with Benji although you will not be allowed to touch Benji at any point during your visit. Children below the age of 18 are not permitted to enter our home as a safety measure. You can see from up close how to diaper a monkey, the importance of fresh vegetables, fruit, and commercial diets, we’ll talk about the importance of having a large monkey enclosure, what the challenges are when keeping a monkey as a pet, the importance of a good enrichment program, and so on. If you’re interested in meeting Benji, contact us!